Even the blandest supermarket feta can be transformed into something special and fully flavoured by this marinating treatment. In fact, you’re better off using an undistinguished brand in the first place, because all the subtleties of a lovingly handcrafted cheese would be lost. For the same reason, use ordinary olive oil rather than your good extra virgin. All up, it doesn’t have to be an expensive exercise, and you get a sense of culinary accomplishment with less than 5 minutes' work. This is more akin to a craft project than a recipe – there’s no cooking involved – and even the task of dicing the cheese can be eliminated if you want to use the kind of feta that comes already cubed (although you’ll be paying for the convenience). A bit of easy knife work, some quick tossing and filling up a jar for a nice sense of culinary accomplishment. To sterilise your jar, wash it in warm, soapy water, rinse it well and let it dry on a tray in a 140°C (275°F) oven. Once jarred, I give the cheese a couple of days’ peace in the fridge to let the flavours develop, and it keeps for about a month as long as there’s a layer of olive oil covering the cheese. When it’s ready to eat, you have a lovely, versatile ingredient at your disposal. I put it out with a little bowl of black olives alongside as a nibble with drinks, or feature it in a more extensive antipasto to be fork-mashed onto toasted slices of baguette or crackers. It sits nicely in salads, and you can make an almost instant pasta sauce with nothing more than a handful of halved cherry tomatoes and a few cubes of feta. Once the cheese is gone it’s the richly infused oil’s turn to shine: add a little lemon juice for salad dressing, or drizzle it over roasted vegetables. Cut the feta into roughly 1cm (½ inch) cubes and place in a roomy bowl. Add the garlic, peppercorns and sprigs of thyme, along with a few stray leaves of thyme. 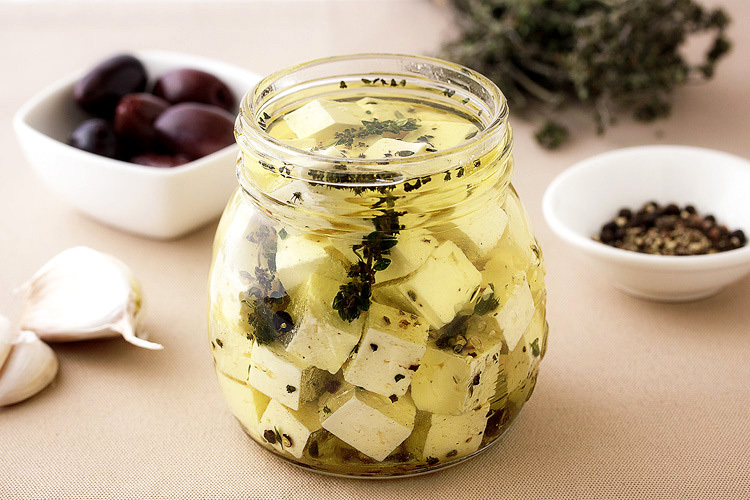 Drizzle over a tablespoon of olive oil and gently toss everything together, taking care to not to break up the feta. Spoon loosely into a 250ml (1 cup) jar and fill with olive oil to cover. Seal the jar and refrigerate for 2 days before using to let the flavours develop. You can keep it refrigerated for up to a month as long as the cheese is covered by a layer of olive oil.